I was sitting in my office this week when my colleague asked me a very thought provoking question. “He asked “ In your opinion why has there been some much turn over in this position?” He went on to say “It pays good and the responsibilities are simple”. I paused for a second. Then I proceeded to give him an overview of all the people whom held the position and what their individual strengths and weaknesses were.. But in the end my conclusion was simple “Adaptability”. Those employees were not able to adapt to sudden change in work scope or with directions that required multi-source inclusion. 20% quit, 45% duties reassigned, another 20% were moved to a less demanding role and 15% were removed out of the department. Understanding this, it caused me to think on the matter a little more. 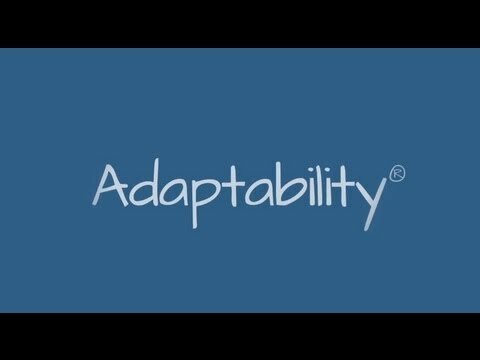 In my research I came upon this article that may give you a little more insight into “ADAPTABILITY”. My long-term goal required that my short-term goals be flexible — adjusting on an almost-constant basis. My first job was on the practice squad in 2003. Then, I earned a position on special teams. In 2005, I was brought in for third downs, and I finally landed a spot as a full-time starter in 2009. At each level, I needed to adapt physically and mentally to changing opportunities. For instance, one adjustment meant playing tackle and gaining weight until I was 315 pounds. Shortly thereafter, I had to lose all that weight to drop to a lean 260 pounds. If I had not been able to adapt every step along the way, there’s no way I would have seen an 11-year career. Competition: What is your competition doing? Are competitors offering something that you aren’t? Has a new player entered the market? What differentiates your business from others? It’s imperative to study the competition so that you know the adjustments that are necessary to outperform them. Customers: Are you connecting with your customers? Are you interactive and responsive? Now, more than ever, the communication cycle has a direct effect on your ability to stay on top of current conditions impacting your niche — allowing you to get a feel for where the market is headed and what your target audience is consuming. Technology: Are you keeping up with technology? Do you frequently look for new ways to streamline what you do? Technology trends can reveal new markets or merchandising opportunities, but they can also introduce new methods to give your business a winning edge. The Plan: Are you regularly reviewing short- and long-term goals to identify any corrections that need to be made? Draw out the big picture for your business — but know that this is merely a starting point that is bound to evolve. A business plan is like a football game plan in that, sometimes, the strategy must change mid-game to adjust to what the competition is doing. Our launch of Athlitacomics Sports Heroes, a line of merchandise that merges professional athletics with super-heroic mythology, exemplifies an instance where my team and I discovered that, to be more timely and cost efficient, we would need to modify our original plan and alter one of our short-term goals. It’s a skill that will help you stay on top of your game — so always be ready to call an audible when new opportunities are identified.